The Barro Group Mt Cotton Quarry in Redlands is the first company in Australia to purchase the world’s most environmentally sophisticated loader in its class. The purchase, the first in the Groups global hunt for environmentally advanced technology, validates Barro’s commitment to develop Mt Cotton Quarry as a leader in sustainability. The fact that Barro Group is the first to operate this type of loader in Australia demonstrates our commitment to being a leading 21st century quarry operator and a company that makes decisions based on minimising environmental footprint. 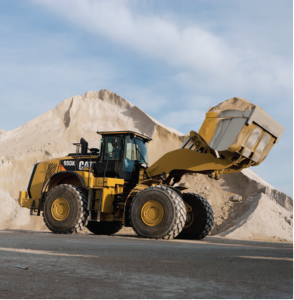 The new YL (Yard Loader) version of the Cat 980K features the new Cat C13 ACERT™ engine which meets the tough Tier 4 Interim US emissions standards. It is an outstanding machine that includes a suite of technologies such as the upgraded ADEM™ 4 control module and the enhanced Mechanical Electronic Unit Injector (MEUI™-C) fuel system. This loader has a Cat Clean Emissions Module and contains a Diesel Oxidation Catalyst, Diesel Particulate Filter and Cat Automated Regeneration System. The machine is built with a 96% recyclability rate (ISO 16714) to conserve valuable natural resources and further enhance machine end of life value. All major components are rebuildable, eliminating waste and saving money by giving the machine and/or major components a second – and even third – life. Incredibly this loader with its 6.4 cu m bucket will allow the loading of a truck and trailer in 3 passes instead of 4. This is not only greater production but more importantly a 25% reduction on fuel burned per truck loaded. Another huge bonus of such machinery is to minimise noise output during its operation. I can’t believe how quiet this loader is. The sound pressure in the cab is 72 Db(a) and externally it is 78 Db(a) at 15 m. This is, on all accounts, one of the most environmental sophisticated wheel loaders available on the world market today and it the first major capital purchase associated with our recently approved quarry extension project that injects millions into the local economy. The company’s commitment to the community and to environmental protection extends to every area of the project. The major equipment evaluation and selection process is currently underway and once complete engineering drawings will be released for competitive tendering. Attending to administrative matters raised in the conditions placed on the recent approval of the Mount Cotton Quarry Project has been the focus for Barro Group as development of Stage One gains momentum. Understandably, a number of these matters require liaison with State and Local Government Authorities which has been a bit challenging through the Christmas and summer holiday break. We have now made an application to the State to permanently close a road reserve. This small parcel of narrow state owned land runs through our property and was partially surveyed five generations ago, in the 1870’s. The fragmented group of thirty or so protestors who turned up at Parliament House today to protest the against the potential granting of Ministerial approval for the Mount Cotton Quarry Extension Project serves as attribute to the group’s misguided campaign of misinformation and untruths. Numbers again today feel well short of the thousands protest organisers called on to attend today’s rally.